Ayahuasca, doorway to the divine. – Is it a particle or a wave? Is it a particle or a wave? Ayahuasca, doorway to the divine. Have you ever heard of a sacred plant that is believed to have the capacity to heal our minds and spirits, and even our physical illnesses? Originating from South America, a plant called Ayahuasca, or also known as Gage, is sought by thousands of people of different cultures who desire to experience healing or spiritual enlightenment. The usage of this elixir by indigenous tribes dates back to thousand of years, which is usually consumed as part of their divinatory ceremonies. It is getting more attention nowadays because of the emergence of various spiritual movements that is spreading across the world. “Aya-preparation” by Heah at the English language Wikipedia. Licensed under CC BY-SA 3.0 via Commons. The Ayahuasca vine (Banisteriopsis caapi), combined with other various shrubs is made into a brew, usually done by shamans, and is consumed orally. This psychedelic drink contains a potent amount of Dimethyltryptamine or DMT, which is responsible for inducing a psychoactive effect, causing the person to witness some sort of kaleidoscopic visual imagery and experience a feeling of euphoria. Graham Hancock, a renowned writer about ancient knowledge and consciousness, author of Fingerprints of the Gods, described this drug as a rocket ship to the other side of reality. 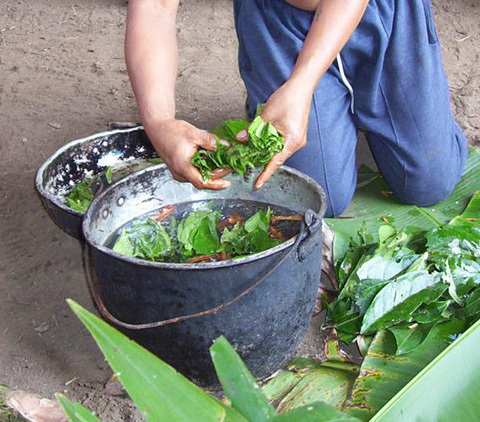 Ayahuasca brings about more than just a psychedelic experience. It is not a recreational drug. Trying it out is not a walk in the park as it causes massive nausea and vomiting, which, is a normal reaction of the body that is associated with cleansing. One finds it terrifying at first, as they are taken back to the horrible scenes of the past. But once they overcome it, they feel very light and at peace. It is said, based on accounts of people who have experienced it, after trying out a strong cup of tea, they started to view the world differently. The experience was like journeying through a conscious dream state and then waking up with a new perspective of truth and reality, a new sense of purpose, and clarity of direction. For some, it served as a psychoactive therapy that cured their addictions and got rid of their depression. To know more about this, watch this intriguing talk (as it was banned from TED) by Graham Hancock.